99/169 Max Braden If you have any nervousness about heights you'll react to a moment or two in this movie, but as a heist it's too easy. Other movies have done this better. So, Sam Worthington is, like, this dude who goes out on this ledge. That makes him a Man on a Ledge. When he gets there, a bunch of people start rubbernecking in anticipation of his jumping all a tall building to his untimely, brutal demise. Except that isn’t what is going to happen. Apparently, the Man on a Ledge is the bit of misdirection needed so that his felonious friends can steal $40 million worth of jewelry. See, when a Man on a Ledge is noticed by pedestrians, they contact the police. The police have no choice but to stop doing all of the policing that defines their jobs and instead join the other pedestrians below, helplessly watching as the would-be jumper determines whether they want to live or die. 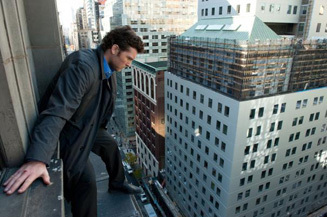 See the latest developments for this project on the Man on a Ledge Movie News page.